Those who don’t think 16-year-olds should have a vote, should listen to the powerful and awe inspiring speech by the 16-year-old climate change activist, Greta Thunberg. Then, you might consider, that not only are 16-year-olds capable of voting; they are more capable of leading the world than many of our current leaders. In a rousing speech to MEPs and officials at the European Parliament in Strasbourg this week, the teenage campaigner berated EU leaders for holding three emergency summits on Brexit and none on the threat posed by climate change. Greta, the founder of the climate change school strike movement that’s gone global, said if politicians were serious about tackling climate change, they would not spend all their time “talking about taxes or Brexit”. She added that politicians were failing to take enough action on climate change and the threats to the natural world, which could mean our way of life being destroyed by 2030. 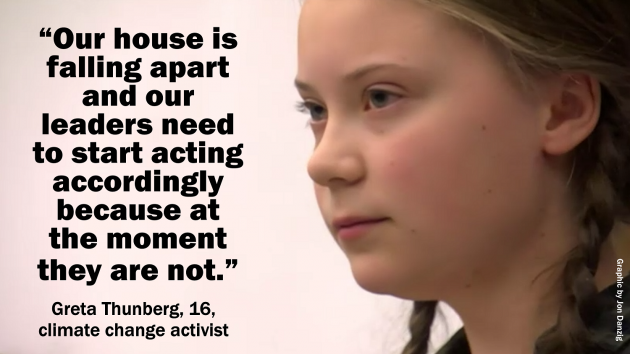 “Our house is falling apart and our leaders need to start acting accordingly because at the moment they are not,” the 16-year old schoolgirl from Sweden told the standing room-only meeting. “If our house was falling apart our leaders wouldn’t go on like we do today,” she said. She said politicians told her that they could not do anything too dramatic on climate change because it would be “unpopular” with voters. Now, if only grown-up politicians would act like that, what a better world we’d have. It’s unlikely that we would now even be on the road to Brexit, because there’s no science or evidence to support it. Instead, we would be putting massive resources behind a serious, co-odinated, world-wide effort to tackle climate change before it really is too late. Just as this 16-year-old has urgently demanded. “It’s ok if you refuse to listen to me, I am after all just a 16-year-old school girl from Sweden. “But you cannot ignore the scientists, or the science, or the millions of school striking children, who are striking for the right to a future.